PHP 7 is the most awaited upcoming version of this well known scripting language. PHP team is working actively to release this new version by the end of this year. Today, the development team announced the release of beta 2 version for PHP 7. Yes, PHP 7 beta 2 is out now. Let’s review the prominent features in new PHP version and how to install it on Linux operating system. Here are some of the noteworthy features in upcoming PHP release. PHP7 is based on PHPNG, which is supposed to add huge performance enhancements to this application. The upcoming version will be almost 2X faster than the previous ones. It will cause more and more PHP based sites and scripts generation. It will let developers declare what kind of return type a function can be expected to have, thus developers will have more control. It will be introducing a new operator <=> for combined comparisons. Return types now supports the newly introduced scalar types. First of all download PHP 7.0.0 Beta 2 from above mentioned URL. Lets start the installation process by running the “configure” command. Please note that its just a simple PHP installation, if you need any specific modules compiled, you can specify them here with configure. Here is how successful configure output should look like. Now run following command to complete the installation process. Congratulations, PHP 7 beta 2 has been installed on our ubuntu system. 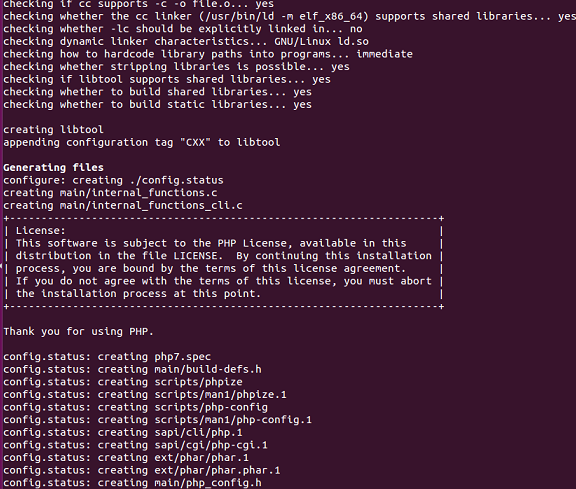 Run following command to verify PHP version and installation details. PHP 7 is going to be a major release and it should re-shape the way PHP applications are being developed. The new features specially performance and speed improvements will make this language a better choice as compared to other available alternatives. I’m finding it difficult to download as some error throws up. I’m using eagleget downloader. can you help? Thank you. Hi Shashaa – what exactly error you are facing?